Bollywood superstar Aamir Khan recently paid a visit to Fashionista Sonam Kapoor. The Diva is shooting for a biopic based on the life of PanAm flight attendant Neerja Bhanot titled ‘Neerja’. Neerja was the youngest recipient of the highest military award for bravery ‘The Ashok Chakra’. She had lost her life while trying to save the lives of her passengers on board the hijacked flight on September 5, 1986. Sonam Kapoor is playing the title role in the film. She had even tweeted her look on her Twitter handle recently. The very much in news upcoming film has many a Bollywood celebrity paying a visit on its’ sets. From Anil Kapoor, Vidya Balan, Boman Irani to Raju Hirani. 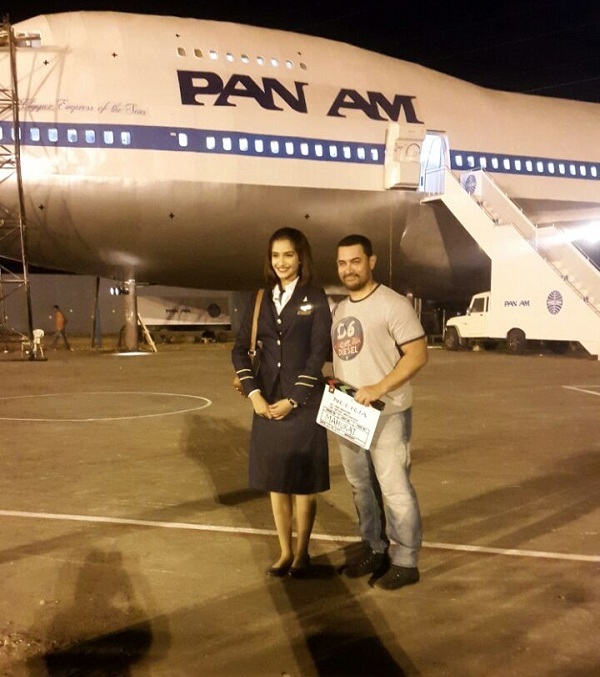 Well Aamir Khan’s visit to the sets, will truly inspire Sonam to give her best for ‘Neerja’.